The Federal Aviation Administration said Friday that despite Friedman Memorial Airport’s appeal to keep federal funding for operation of its air traffic control tower, that funding would cease for Friedman and 148 other towers across the nation beginning April 7. The FAA announced a possible termination of funds earlier this month, but gave airports until March 13 to appeal the decisions. The Friedman appeal letter, dated March 10, cites “unique operational challenges” at Friedman, such as head-to-head approaches and departures that require more hands-on direction from the tower. The letter states that closure of the tower would place more of a burden on the tower at Salt Lake City and points out the Friedman tower’s role in security during visits by government officials or foreign heads of state, and the role of the tower in keeping the taxiway clear while aircraft are using the runway. The appeal was denied. The FAA stated in its original letter that appeals would only be considered if the airport could prove that losing the tower would have a nationwide impact. A news release from the FAA stated that the criteria it used to make that determination were threats to national security, economic impact beyond that of a community, impacts on multi-state transportation and the extent to which an airport is an important diversionary airport to a critical hub. 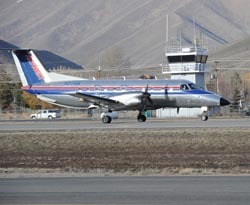 Three other Idaho air traffic control towers will lose funding: Idaho Falls Regional Airport, Pocatello Regional Airport and the Lewiston-Nez Perce County Airport. The air traffic control tower in Twin Falls was not included in any of the final closure lists. The funding cuts will be phased in over four weeks. Friedman Memorial Airport is listed in the third group of closures, meaning that the tower would lose all funding on May 5. FAA Administrator Michael Huerta said in a news release Friday that the FAA would work with the airports and air traffic control tower operators to keep air operations safe even in the wake of the closures. “We will … ensure the procedures are in place to maintain the high level of safety at non-towered airports,” he said. Alaska Airlines spokeswoman Bobbie Egan said Monday that the airline, which operates as Horizon Air seasonally in Sun Valley, already has some of those procedures in place. SkyWest spokeswoman Marissa Snow said earlier this month that that airline also expects to see only minimal impacts. Friedman Memorial Airport Manager Rick Baird said that if the tower were to close, it would mostly affect aircraft making instrument-based arrivals or departures. That method is opposed to visual flight, and relies more on information given by the air traffic control tower and flight instruments on the aircraft. Baird said the facility in contact with instrument-based pilots would be in Salt Lake City, which would only be able to handle about four or five arrivals and departures per hour. He said most commercial and general aviation flights use instrument-based procedures, and that the airport can see up to 32 operations per hour on some busy weekends. Without the tower, he said, pilots would be responsible for using shared radio frequencies to ensure “separation,” or a safe area of space around aircraft. But whether the tower will close remains uncertain. The Friedman Memorial Airport Authority called an emergency meeting on Thursday, March 21, to explore its options. Though the decision from the FAA had not yet been announced, many of the authority board members were going to be out of town and Baird said he needed to have a sense of how they would like to proceed if funding was cut. ( Investigate funding the tower on a monthly basis with the expectation that Congress could choose to reinstate the budget cuts. ( Consider legal action against the FAA. ( Pursue the latter two options at the same time. Baird said funding the air traffic control tower would cost roughly $45,000 to $50,000 per month, depending on whether the cost of liability insurance would be affected by the FAA funding cut. Baird and airport attorney Barry Luboviski said legal action could cost anywhere from $100,000 to $200,000 and may not be successful. Baird said the basis of the legal action would be that the FAA did not follow its own procedures in deciding which air towers to close. For example, he said, most changes at Friedman—including the ability to allow regional jets to operate at the airport—must undergo a rigorous safety risk assessment, something that did not occur with the air traffic tower closures. Luboviski said a legal action could result in an injunction that would make the FAA stay its decision to cease funding until proper safety reviews are completed. However, members of the authority board said they were leery of pursuing legal action against the federal government. Hailey representative Susan McBryant said she opposed either funding the tower or pursuing legal action. Others on the board urged patience on legal action and any steps regarding funding. Many of the other authority members said they felt that other airports would sue the FAA, precluding the need for Friedman to take on the burden or expense. Authority Chair Ron Fairfax said he thought the odds of winning a lawsuit against the federal government were low and the authority would be better off investigating how much it would take to fund the tower and where that funding could come from. The authority will discuss further action during its meeting Tuesday, April 9.